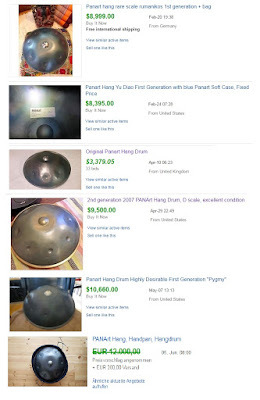 Responses to a recent post over in the Handpan Instruments Facebook group appeared to suggest that there is currently some confusion regarding the prices that PANArt Hang are selling for via the eBay auction platform, as we find ourselves mid-2017. While often-cited un-witnessed deals between friends see Hang supposedly traded for little more than hugs and rainbow-dust in rare cases, in terms of gauging current prices for genuine PANArt-made instruments sold on the open-market, love it or hate it, eBay remains the only real (and transparent) window into how the land lies on that front. Meaning that while whenever a Hang finds it way onto Facebook for sale, everybody and their mother will have an opinion about it - particularly regarding the price. The information you’ll find there is generally confusing (or confused) at best - and intentionally misleading for a variety of motives, at worst. As we can see from the image above-right, with the exception of one particularly poor offering of a Hang in (seemingly) pretty bad shape, and with little in the way of information/audio/video to support the sale, which sold for just short of $3400, Hang prices remain steady, if not having increased. Three first generation Hang have sold for prices between $8395 up to $10660. While a second generation was sold for $9500. And a free integral was sold for (presumably - best offer was accepted) somewhere around the 12000 Euro mark ($13500). With the influx of newer Handpan makers in recent years, it is clearly observable that Hang sold at these prices are no longer flying off the shelves like hot-cakes, as they did back in the day. With those simply seeking a playable instrument now having far more affordable options to choose from. But it is also clear from the sales data above, that there still remains a market for PANArt originals, and musicians (and/or investors) who are willing to pay a premium, for these soon to be relics of Handpan history.